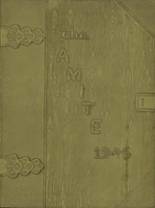 Listings of high school yearbooks for Amite High can be found below. You will find former students who are seeking yearbooks, those looking to sell a yearbook and general yearbook requests among the Amite yearbook listings. This yearbook section was created to help alumni post yearbook classifieds. I never got one and lost my graduation pics and would like a yearbook! If anyone has a 1976 year book for sell I would like to purchase it. Please contact me. Would like to buy a 1975 yearbook. Looking for 1974/75 Amite high yearbook.